Strindberg’s Miss Julie never seems to quite fall out of fashion but even by its standards, London has been awash with the play. This is the third major version in less than a year, and it has been only six months since audiences at the Barbican were left underwhelmed by the high-profile casting of art-house favourite Juliette Binoche in the title role, whilst those who saw Mies Julie were rather more thrilled by the South African reinvention and the Young Vic took it upon themselves to revive Patrick Marber’s After Miss Julie. For all the different qualities these productions brought to Strindberg’s original they must be regarded to be drifting in the wake of Katie Mitchell’s exceptional production, which contains a lacerating truthfulness that makes it almost unbearable to watch. The most remarkable element of the exposure of the truth in this most naturalistic of plays is that Mitchell’s deliberately subverts audience expectations of naturalism by introducing many layers of artifice in order to produce a dislocating, alienating experience. Fraulein Julie contains all of the directorial tics of a Katie Mitchell production; television cameras are used almost continuously alongside the action, a set creates physical barriers between audience and actors, sound booths overlay conversation and Foley artists provide live sounds effects. The audience are left in the position of watching both the back of a TV studio at the same time as watching a radical reinvention of the Strindberg play – and yet despite all this feel no dissonance as the events unfold. These traits in Mitchell seem appropriate – in so far as there are auteurs in theatre, it is hard to imagine many British directors fitting the bill better. Her natural reference points seem to be from Russian cinema – with the slightly woozy quality of Sokurov’s The Sun and its obsessive focus on Hirohito being particularly reminiscent in the utter focuus on one character even as events of more dramatic significance happen external to the action. It is not that Mitchell has a filmic quality to her work but that she has the auteur’s passion for pursing a singular vision with seemingly little regard for the enjoyment of the audience. It expresses a confidence in her own belief, and that if the belief is proved correct then the audience will be taken with her. Fraulein Julie is an experience and rarely a particularly pleasant one; it is draining, august and defiant in its lack of concession to those watching. It seems a rare person who can increase the level of austerity attached to Strindberg but this is what Mitchell has achieved. A day after performance it is still impossible to attach a sense of how ‘good’ it was – even in tragedy there is usually a way to qualify enjoyment, be it through plot, character or performance. Here the plot is stripped away to focus entirely on one character, but the character is provided with very little interior life and the performances themselves are muted through their heightened naturalism. However there is something about the whole affair that is undoubtedly brilliant and possibly makes it the most genuinely ground-breaking production of the year. In Mitchell’s previous work there has been an attempt to force her ideas onto plays that are not best suited to the technique. With Fraulein Julie, Mitchell has found the content to harmonise with form. The popularity of the play is always surprising because the plot is remarkably old-fashioned for a modern audience but by shifting perspective to the Maid, Mitchell has cast a whole new light on the tragedy. It is self-evident to a modern audience that the Maid should be the tragic centre – a woman who watches her fiancé hold an affair with her mistress right in front of her eyes. Strindberg gives her little dialogue but she is on stage at vital moments and like all servants it seemed inevitable that she knew more than appeared. Mitchell picks up this thread and follows it to its natural conclusion, which is a play that entirely focuses on the perspective of the Maid. With use of cameras Mitchell creates a genuinely new form of ultra-naturalism. Despite the alienation techniques that would seem to distance the audience from the action, the use of close-ups and sound effects brings the audience into the heart of the action whilst also being able to view the play in the whole concurrently. Reflecting the true life of a domestic servant, very little happens for long periods as, knowing the play, the tension increases off-stage. The audience can only follow the Maid, and become complicit in her waiting and watching. However the action that does take place is heightened by the sound effects being miked and the use of cameras to zoom in. Each action embodies Stanislavskian ideas on physical action and as a result is imbued with a real dramatic weight. An early action of washing and slicing kidney’s for her finance’s dinner becomes loaded with tension, whilst later the action of pressing flowers has a tragic sense of suggesting a desperation to retain an unachievable sense of permanence whilst all around is in transition. The highlight of all of these moments, and something that demonstrates the value in Mitchell’s technique, is a wonderfully still moment of the Maid heating a hairpin and curling her hair around it in a desperate attempt to mimic her mistress. 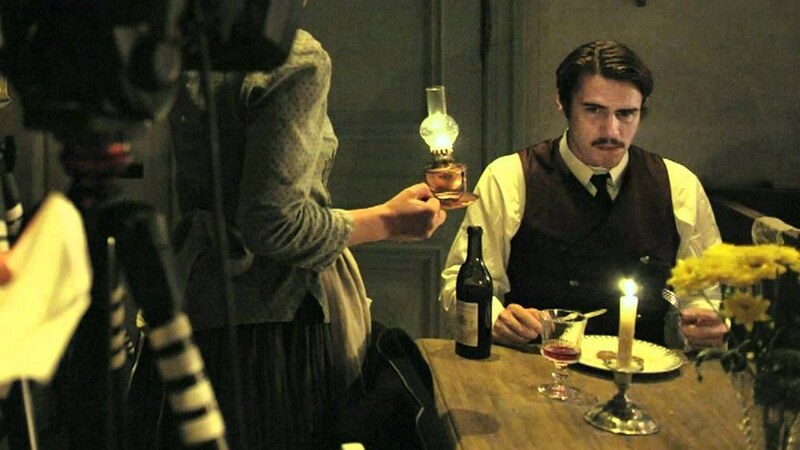 The moment captured in close-up is heart-rending as the audience cannot help but notice the cheapness of the iron, the use of the candle to provide heat and the amateurish end result that all point to the futility of the gesture. This form of theatre is unlikely to ever take over the mainstream and there is some relief in this; there is very little fun to be had and the seemingly brisk 75 minute running time felt as draining as the 2 ¾ hours spent in the company of McAvoy’s Macbeth. However in the week that the Olivier Awards painted a chocolate-box picture of British theatre, it is heartening to see true radicals selling out the Barbican. British theatre needs Katie Mitchell in the same way that British cinema needs Andrea Arnold or Clio Barnard – strong voices that sit apart from the mainstream and make boundary-pushing work that is required watching. It is work that looks to the past but is genuinely new in outcome. Fraulein Julie is to be celebrated even if it isn’t meant to be enjoyed.